AWESOME PEOPLE TO WORK WITH We got great customer service working with Sean, the designer at Caribbean Pools. He was very patient while my wife constantly changed things. He had some great ideas that we ended up implementing. It worked out wonderfully. The whole installation went smoothly. There were a few hiccups mostly due to weather, not because of the company. They communicated well with us which was important to me. Everything functions well and we recommend them to our neighbors all the time. EXCELLENT SERVICE We met with Bryan only once. He knew right away what we wanted. The whole time the pool was being built there was no one at home. Seems like the process went very well until the very end when we had water overflow. Given the fact that the whole thing was done without us being at home to control the water flow we can consider this a minor problem. Last winter one of the water pipes broke due to cold weather; I contacted Bryan and he sent someone to repair it right away. 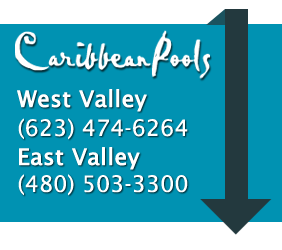 Thanks for doing an excellent job, Caribbean Pools! VERY SMOOTH Caribbean Pools designed and built the pool for us and it turned out nicely. We worked with Brian and he was down-to-earth. He really listened to what we wanted and designed the pool to our needs.